This one? It's the Charger that fell out of an airplane. They built eight more, and only two survived in running condition. But don't worry, Dennis McCarthy will fix one up. Meanwhile, the director of Furious 7 drives a Prius. Dennis McCarthy is the man behind a bunch of your favorite movie cars, and his hangar also hides most of what's left after Furious 7 got done. All cars are tuned to 500 horsepower, simply because 400 isn't enough according to him. Also, the Cudas, Camaros, Mustangs, Superbees, Chargers, and pretty much everything else they drive use the same powertrain package: an LS3 with a Turbo-Hydramatic 400 transmission, coilovers and big Brembo brakes. Of course the Aston Martin DB9 could keep it's V12 just like the six Subaru STIs the company gave Universal Studios for free could keep their boxers. Does Dennis feel bad when he has to use a plasma cutter on a brand new Nissan GT-R? Of course he does. But it's part of the job. 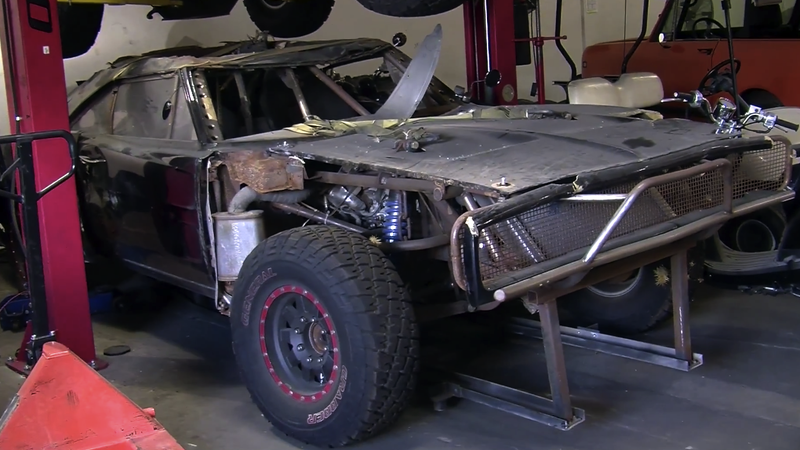 More than 60 people work on the vehicles alone for a big budget movie like this, and while building Dom's Charger takes them less than two weeks, it's worth noting that only basket cases are sacrificed in the process. They pretty much take the A-pillars, the roof, the top to the quarter panels and the floorpan. The rest is composite and aftermarket stuff. Chargers on mud tires remain a big win-win.